FURIOUS PP officials are demanding Junta president Susana Diaz ends her Moroccan holiday to ‘take responsibility’ over shocking revelations in the training course fraud scandal. Andalucia’s PSOE government finally acknowledged on Thursday that millions of euros of taxpayers’ money was syphoned off to a series of bogus training courses for non-existent students in Spain’s second biggest financial fraud ever. They have only now published a list of ‘companies’ the money went to, after months of media and public pressure. An incredible 70% are believed to have simply been ‘fronts’, while others padded out attendance lists with students who were not actually present. The corruption outrage – which involved hundreds of professional training courses – saw Andalucian officials take more than €3 billion of EU education funding. Diaz has been accused of turning a blind eye to the accusations and PP officials have called for her to cut short her holiday in Morocco and return to face questions posed by Operation EDU. Former Andalucian tax office chief Angel Ojeda was arrested as part of Operation Oscar, one of many investigations into the scandal. The police report claims Ojeda was leading a ‘very complex business network consisting of more than 50 companies, foundations and associations’ that had received ‘tens of millions of euros’ from the Andalucian government. 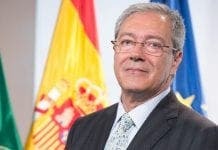 The PP’s Moreno Bonilla has accused the IUCA, the governing body of the PSOE, of ‘covering up this corruption’. Ms Diaz was called upon to suspend her trip to Morocco and provide further clarification of the data released last week by the Junta following strong pressure from the opposition. Mr Salas claimed that publishing listings wasn’t enough and that it was necessary for the ‘black holes’ in them to be explained as well. According to him, Ms Diaz’s failure to do so ‘demonstrates her political cowardice, her lack of respect for Andalucians and her failure to act against corruption’. The Junta also came under fire after it was declared exempt from having to justify company aid given to the wife of the PSEO’s former number-two, Rafael Velasco. Mr Velasco resigned after it came to light that his wife’s company, Aulacen Cinco S.L., received aid totalling almost 100,000 euros for training courses. Data was published by the Junta on their website following revelations by El Mundo that a company administered by a member of the PSOE was exonerated along with Ojeda’s business conglomerate, the UGT and CCOO unions, employers, as well as a multitude of municipalities. Amazing and unprecedented levels of corruption. Diaz has been a big disappointment, why should we really expect anything different? The EU are just as bad for giving the money without proper audit procedures (ring any bells?). Let’s hope that this is the beginning of the end of this despotic and destructive administration at the Junta de Andalucia. Any chance of booting them out now before they inflict even more damage? To think that the Junta de Andalucia had all that money, yet they refused to pay the Priors any compensation after ILLEGALLY demolishing their house. The Priors are still living in their garage with no electricity and there are thousands of other homeowners all over the region who are under threat of demolition because of this crowd. They have no humanity and are not fit for purpose. Fred, there was no reason to expect anything different from Diaz, she is out of the same mould as her predecessor. I hope they all swing. This goes from north to south, east to west….every department of spainsh govenment. Roll on the revelution..lets take spain back for the people . Sadly i think that the people are blind and deaf to it, pumped full of propaganda…..
She looks like butter wouldn’t melt… Probably the secret of her success. Now we know why they are bringing Gibraltar back into the public eye in the government controlled Spanish press . Its all smoke and mirrors . I wonder how many more corruption scandals are simmering below the surface. Stefanjo, she is not successful. She is presiding over a broken economy (worst in the whole of Spain) with staggering unemployment statistics and businesses going bust all over the place – why do you think Andalucia was named “the Banana Republic of Spain”. Her administration at the Junta de Andalucia are a dead weight that has effectively set the region’s feet in concrete boots. If that is success, I hate to think what failure looks like. Irony Jane. Irony. Besides, till she’s in the Nick, she’s laughing. This sounds very much a case of the kettle calling the pot black, in my opinion, only in this case the pot has hardly been on the fire enough time to get stained itself. Diaz being a relatively new kid on the block and with a squeaky clean slate, can hardly be blamed for what may have gone on before and she has sworn to extricate the culpable and recover the money, which is more than the PP has done so far. Even Eduardo Inda, Chief Editor from the investigative El Mundo newspaper, who published the PP Barcenas figures and all the corruption that continues to see the light of day, called her a very Decent politician a few days ago on TV, and he should know what he is talking about. 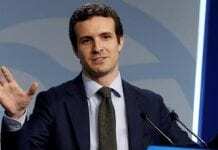 Accusations of cover ups coming from the PP quarter and calling for resignations when none on their side have resigned, should be taken very cautiously indeed by those that have the power to change the course of Andalucía, a historic socialist and leftist bastion, in what would otherwise be a one party state, with all that that implies. What, no counter comments? I can’t beliiiieve it!